"It's Halloween night and while there may be a chill in the air outside, the atmosphere in here is sizzlin' HOT, HOT, HOT! Welcome, muscle lovers here and out watchin' us at home... welcome to the Thunderstud Arena!!" Big Ben Halstrom yelled enthusiastically into the mic that sat upon his table in the center square of the arena mere steps away from the professional wrestling ring. "No tricks here, Ben, that's for sure. It's an exciting night and I can't wait to see these two studs tear each other to shreds!" Jason 'The Jackhammer' Jackson agreed with the colleague seated by his side. The two men were former pro-wrestlers-turned-pro-bodybuilders and had agreed to lend their celebrity and commentate on tonight's Main Event. "It sure is, Jase," Ben beamed, slapping the table and pumping up the crowd around them. Every now and then, the two would rise and pose for the fans, their bodies clothed only in tight, skimpy thong straps. "Been waitin' on this one for weeks! You know how long these federations like teasin' us and makin' us wait." 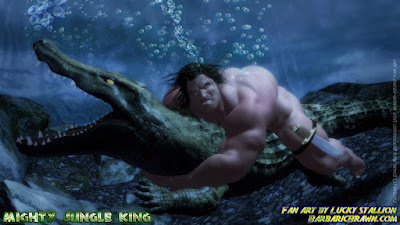 Here's my single image art work: Mighty Jungle King. Hello to all of my muscle monsters! I've been planning my next tale (a Halloween story) for a while now and am ready to post the teaser for it. This one will feature entirely new characters in the new 360° environment I've spent some hours putting together to serve as the arena. Gone are the blank backgrounds of light that I've used in the past; moving forward, there will now always be a massive crowd of men in the stands spread out behind the four barricades that surround the wrestling ring. These two men sitting here are the new commentators for this fight. The blond on the left is Jason "The Jackhammer" Jackson and his co-commentator is Big Ben Halstrom. They were once pro wrestlers who left the federation to become professional bodybuilders and have agreed to lend their celebrity to the match's Main Event. Keep a look out for this story coming in October!